Ever since Android Auto first hit the market back in 2015, you've needed to plug your phone directly into a compatible head unit in order to get the apps and screens mirrored from mobile to car. In 2018, that setup will change, as Android Auto goes wireless. JVC Kenwood is planning to introduce a couple of wireless Android Auto units at the big CES show next week, reports CNET. One will have JVC branding, one Kenwood, and they're both going to feature a 1,280 x 720 pixel HD display for seeing your sat nav apps at a nice, sharp resolution. Like a lot of similar units, the devices will support Apple CarPlay as well as Android Auto, though right now it's not clear whether that functionality will also be wireless. A small number of wireless CarPlay units have already appeared. 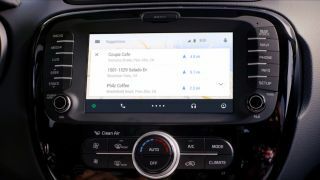 Google teased the arrival of wireless Android Auto support back in May during Google I/O, so this isn't a complete surprise. Support for the "OK Google" voice command, and the ability to use Android Auto on your phone as well as a head unit, was announced at the same time. That's all we know so far about the new devices – JVC Kenwood hasn't said anything official as yet – but all the blanks should be filled in when CES gets underway next Monday, January 8. Of course we'll be there to bring you all the news from Las Vegas. There'll be a flood of new tech on show and car tech is likely to play a major role as our motors get smarter and smarter. Look out for a slew of new car stereos to be announced at the show, supporting the platforms developed by Google and Apple – and this time requiring no wiring.